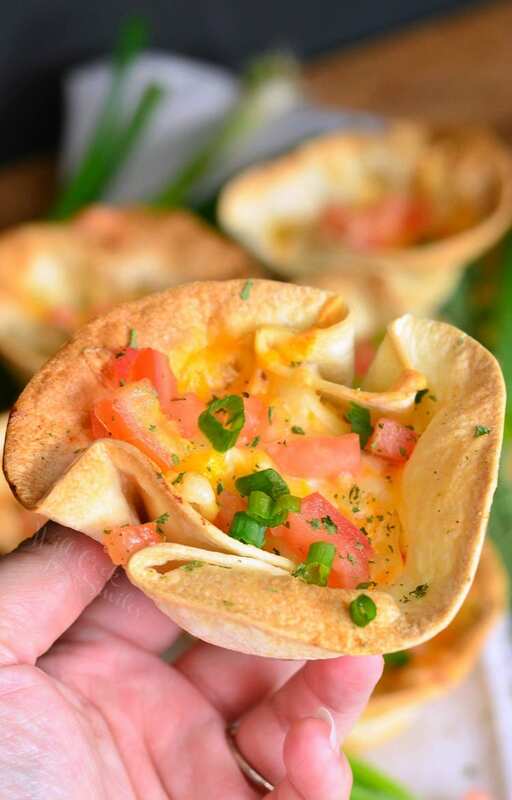 Forget serving traditional dips, chips, salsa, and guacamole for the big game, here is something your fans will cheer for the loudest. 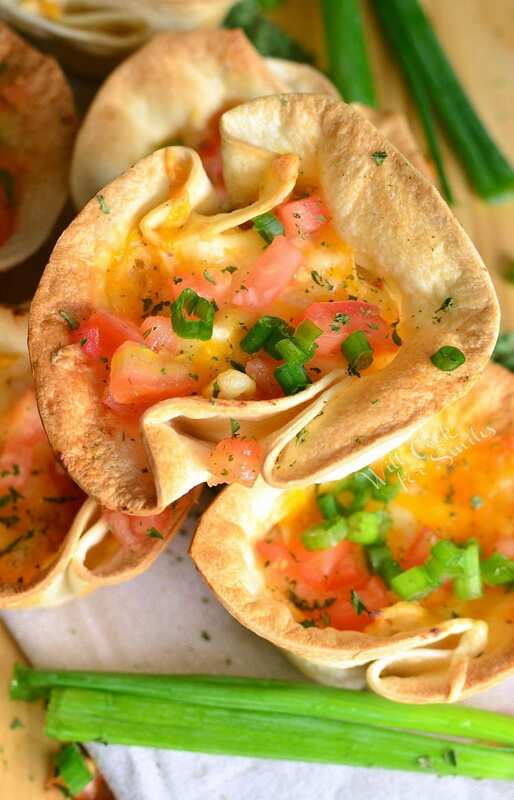 Heavenly crispy tortilla cups filled with creamy chicken enchilada mixture and more cheese. It’s been a year since we moved into our house. It’s still coming together with two rooms sitting being pretty much empty. Moving from a small apartment into a house leaves most of the house empty. Even though we’ve been furnishing and decorating the house for the past year, we remembered to get the important stuff first. We made sure that out first purchases were a big dining room table and entertainment center so that we can now have our friends and family over. Is it odd that when we got our house, we were most excited about finally being able to entertain? First thing that my husband did after we closed on the house is tell our family that we will now be hosting all major holidays. Ouch…not like he has to cook it, right? But I was up for a challenge. After hosting my first Thanksgiving and then Christmas, in addition to several barbecue parties and family dinners, I’ve realized that hosting parties is EXHAUSTING! So here we are, coming up to another huge party of the year, the big game, and I’m glad that I had a break for a couple of months because it’s a big one. Super Bowl parties are big, loud, and filled with more food than a Thanksgiving table. It might be a very different food served at the football parties but you know what? I like it so much better. You can’t beat Dips, nachos, taquitos, and mini cheeseburgers. And for, there is another addition to the big line-up. 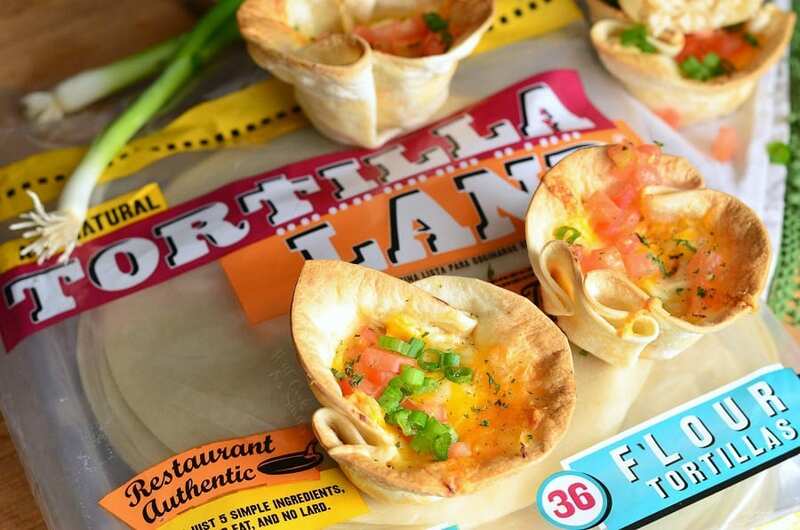 Move over guacamole, chips and nachos, here come tortilla cups and they are rocking. 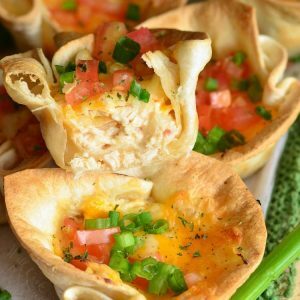 Crispy baked and filled with creamy, cheesy chicken enchilada mixture, these tortilla cups are sure to be the highlight of the table. 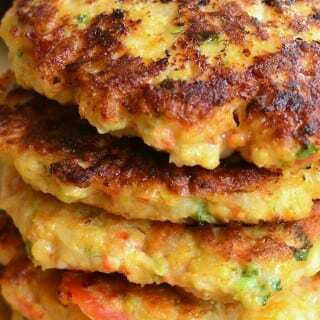 They are easily made with TortillaLand raw flour tortillas and stuffed with an easy chicken mixture. For a big party, you’ve got to shop big. That’s why I run over to Costco before every party I’m hosting. I also like to keep a pack of TortillaLand raw tortillas on hand for making tacos, quesadillas, and taquitos. Once I discovered raw tortillas, it’s hard to use something else. They are lighter, tastier, and I love the fact that TortillaLand tortillas only have 5 simple ingredients that are well known and easy to pronounce (wheat flour, water, canola oil, salt and sugar). So next time you’re at Costco, make sure to also grab some TortillaLand raw tortillas in the refrigerated section. 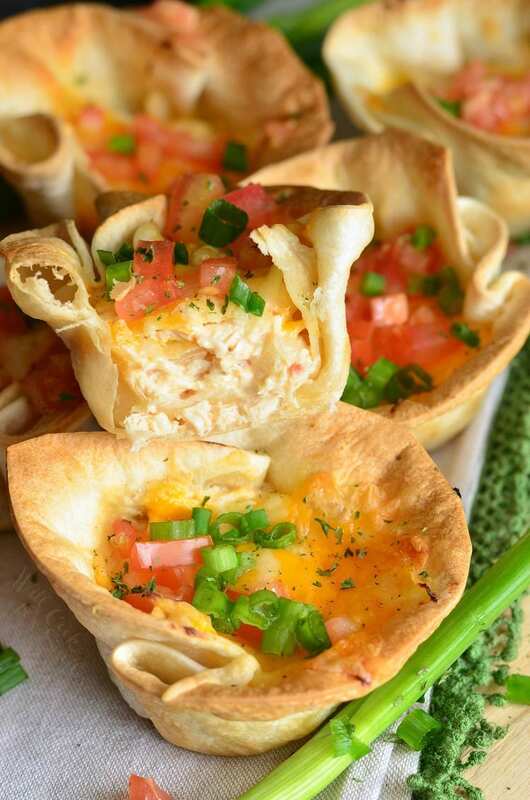 Heavenly crispy tortilla cups filled with creamy chicken enchilada mixture and more cheese. Preheat a medium cooking pan over medium heat. Add vegetable oil, sliced onion, and diced tomatoes. 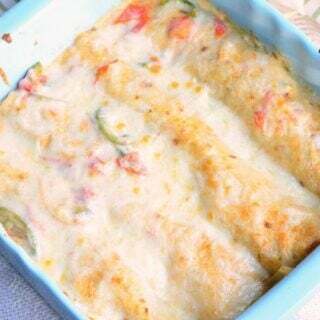 Cook for a few minutes, add enchilada sauce, salt, red pepper flakes and mix well. Nestle chicken tenders in the veggie mixture, cover and cook until done, stirring occasionally. Take off heat. Take out chicken tenders and shred the meat using two forks. Place shredded chicken into a mixing bowl. Using a slotted spoon, take out veggies and add them to the chicken. Add cream cheese and mix in until fully incorporated. Mix in shredded cheese and 2 Tbsp enchilada sauce. Add more salt if needed. Preheat oven to 375 and grease a muffin pan. Gently fit tortillas into the muffin cups. Carefully poke some holes with a fork in the bottom and sides of tortilla. Sprinkle some shredded cheese into each cup. Top off with some diced tomatoes, green onions and cilantro. 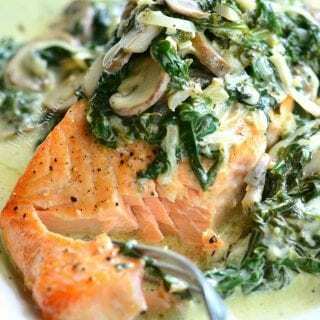 Recipe from Lyuba, at willcookforsmiles.com, All images and content are copyright protected. Please do not use my images without prior permission. 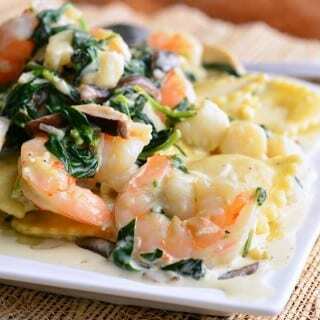 If you want to share this recipe, please simply link back to this post for the recipe. Thank you. 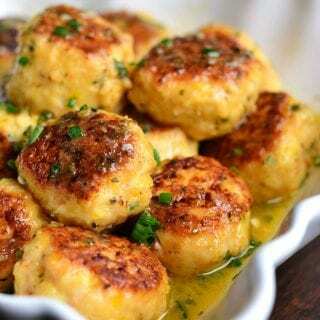 For Superbowl, I bet you have to make at least 5 dozen because those little bites will go fast!! We do use flour tortillas a lot although I’ve never tried the Costco brand — I’ll pick some up on my next Costco run. 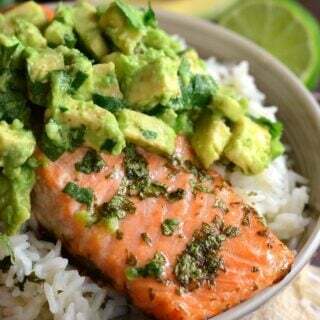 Great recipe and photos! Definitely depending on how many other goodies you’re serving, lol. It’s actually not a Costco brand, it’s a TortillaLand. Make sure to enter the giveaway, dear, 😉 !